While their countrymen were deciding whether to remain part of the United Kingdom, the members of Scotland's Royal and Ancient Golf Club were deliberating on something else: whether to admit ladies to the hallowed halls of their literal old boys' club. And hey, they decided they would. Good show, chaps! You were just two years behind the Augusta National. The vote Thursday was a collective, corporate effort, unlike in the early 1900s, when Britain's suffragist movement spelled out, "No Votes, No Golf," in sulfuric acid on select courses and threatened to target the Old Course. So, what changed? 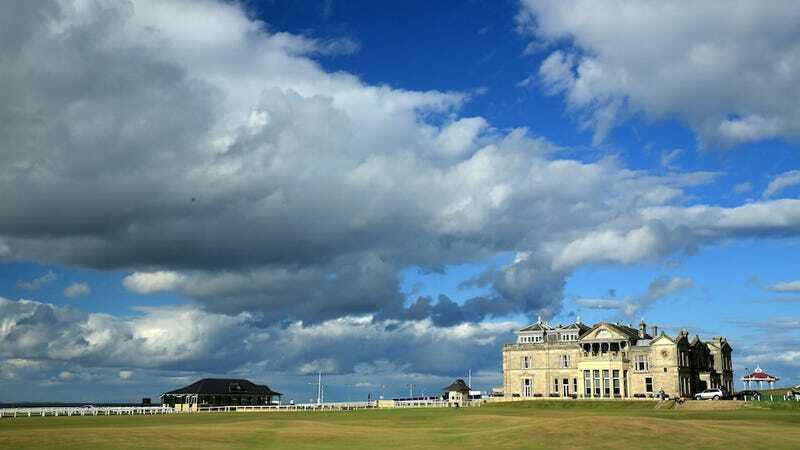 The club is home to the R&A, which runs the British Open and has generally taken it upon itself to make sure plenty of people want to play golf. And guess what? Dudes-only rules don't exactly endear your sport to the female half of the world's population. Plus politicians and other critics were increasingly calling on them to get with the program. So they did the sensible thing and threw the doors open: Around 75 percent of the club's 2,400 members voted, and the yeas carried with a healthy 85 percent majority. Women are allowed effective immediately. Golfing remains super boring, tolerable only when soused.